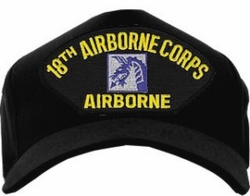 This 18th Airborne Corps Black Ball Cap Hat is five panel, emblematic, poly, dark under the visor, full back (not mesh) and fully adjustable. All of our Military hats are fully guaranteed. These are the same ball caps found throughout the Military. This cap would make a wonderful addition to your collection or a great gift! Our Ballcaps are made in the U.S.A and SHIPPING IS ONLY $2.99* within the United States and Canada. We will be glad to include scrambled eggs, which is an Embroidered Gold Oak Leaf added to the brim of the cap. Caps with scrambled eggs are usually shipped 3 to 4 days after ordered.